We all make various acquaintances throughout our lives—people who come into our circle for a season and then move on. With some, we’re content to let them go. But with others, we’re not. Once an acquaintance turns into true friendship, we hold on more tightly to that friend. A friend is a favoured companion for whom we feel affection or esteem. Why is a friend favoured? Most likely, it has much to do with how we feel when we’re with him or her. A friend accepts us as we are and is patient with our faults. A friend points out our strengths and rejoices at our successes. A friend’s presence and listening ear fill a void in us and give our lives a sense of validation and greater depth. Do you have such a friend? Do you know how to be that friend? 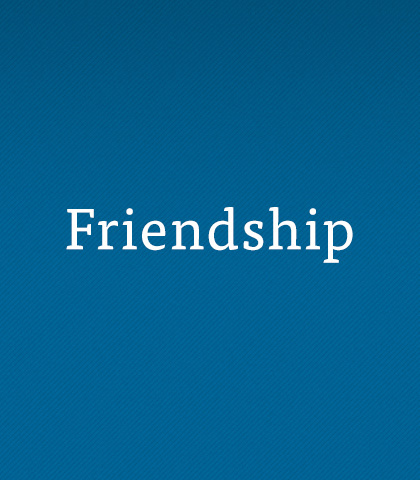 These resources can help you recognize the need for friendship and develop the attributes that will make you a treasured friend to others. and a brother is born to help in time of need. Love is patient and kind, it’s not jealous, it doesn’t brag, love isn’t proud. Love never gives up on people—it never quits. Caring for others should always be the basis of any confrontation. When you have another’s best interests at heart you’re motivated by love instead of anger. When you care about others you discover it doesn’t matter who gets the credit. What matters is you help others reach their highest good.